Your child isn’t going to become a great reader over night, but it can happen one book at a time. But what is the best way for you to choose the right book for your child to read? It may be second nature to feel like you should be picking your child’s books, but the fact remains that letting your child choose their own books is a skill that they should learn at a young age. By allowing your child to choose their own books independent of your input, allows your child to learn the different reason we choose a book to read in the first place. When your child is ready to start reading, begin instilling the fact that we read for a purpose– whether it’s to learn something or if the purpose is simply for enjoyment. 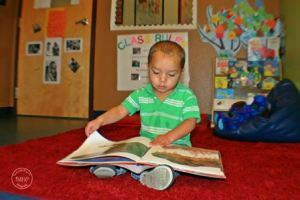 Have your child browse through the books either at the library or the bookstore. If this seems to be too overwhelming, then have them narrow down their choices by either a type of book (fiction or nonfiction) or by action, funny or other subject. Say “yes” as often as you can when your child selects a book that he or she is interest in. Rather than saying “non” try saying that a choice is a “not so great” selection. If your child selects a book that is beyond his or her reading ability, solve the problem by reading the book out loud with your child. Let them read as much of the book as possible, you can jump in if there are difficult parts. If your child has really enjoyed a particular book, remind him or her of the author name when they are selecting books the next time.